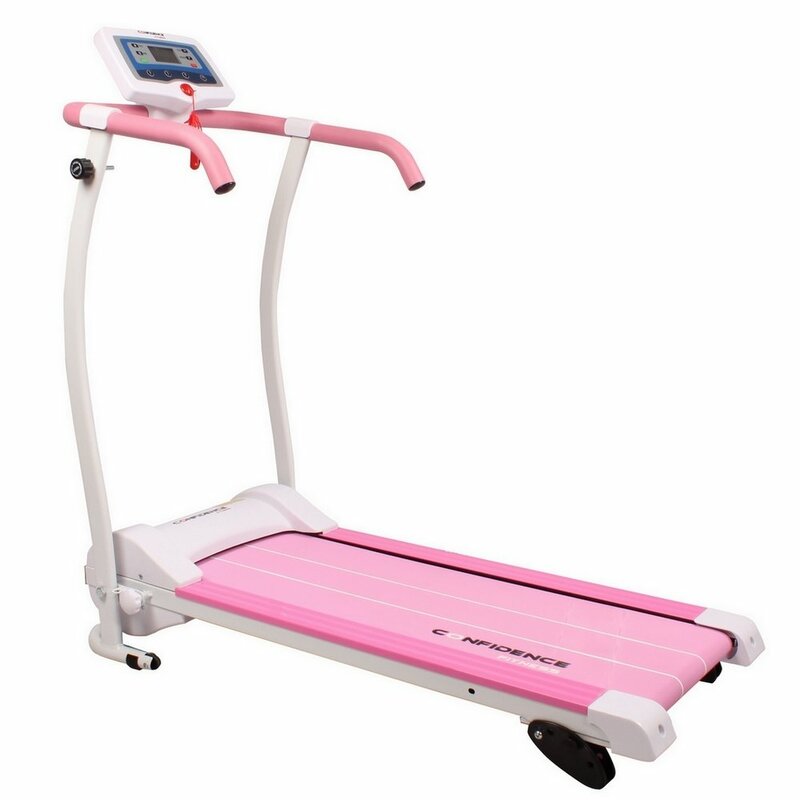 Pink and white Confidence Power Trac Pro is a motorized electric compact treadmill with a 735-watt power (1 HP) and a folding design. It is rated 4.1 out of 5 stars by 103 customers at the time of this review. And you can purchase it with or without an equipment mat that costs around an extra 30 dollars. You also have the option to get the expert assembly- please see the Amazon product page for the relevant additional costs. You can use this versatile treadmill with the user-friendly features for walking, jogging or running and get a great cardiovascular workout. It has the three manual settings of 2, 3.5 and 5 degrees to give you more challenge and the ability to burn more calories in the same amount of time. You can’t adjust the incline levels via the display panel, but manually. You can run at up to speeds of roughly 6 mph (10kph) from 1 kph. You have the Speed +, Speed -, Mode, Program, Start, Stop and quick pre-set speed buttons for 3, 5, 8 and 10 kph. You can select from one of the 12 integrated cardio programs through the P button. You have the standard indicators of calories, time, distance and speed but no heart rate- there are no sensors on the handles. You can work out regularly or whenever you want in your own home and fold it easily and roll on its front transportation wheels till your next session. There is an emergency stop clip and you can attach the cord to your shirt. So the treadmill can stop safely in case your fall down or drift back and there won’t be accidents. 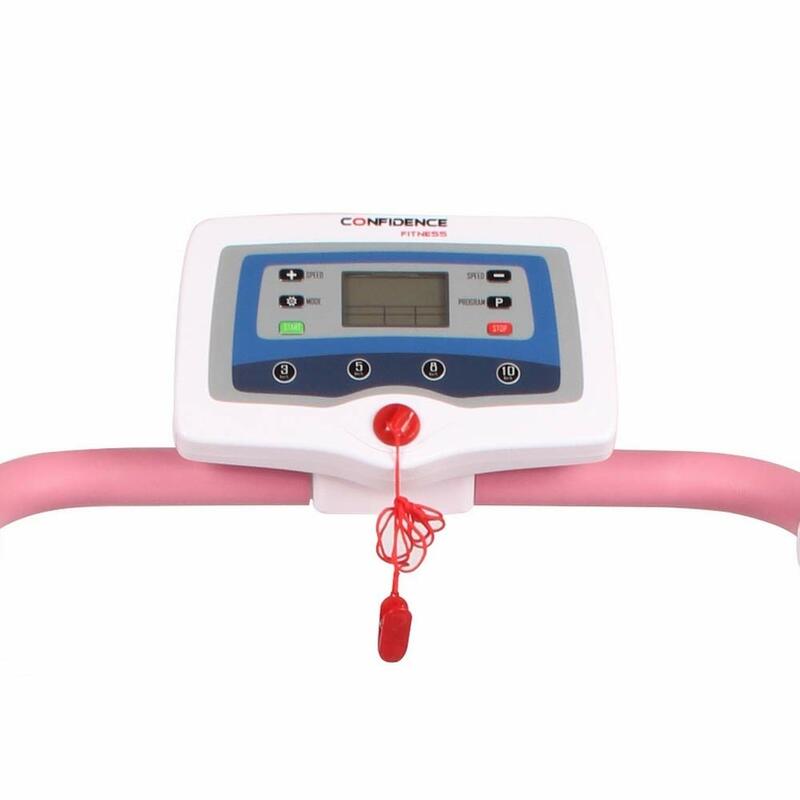 Pink Confidence Power Trac Pro weighs 52 pounds and measures 49 x 24 x 47 inches as assembled with an arm length of 22 inches. The running belt that measures 14 x 39 inches should be adequate unless you have a very large body. It measures 49 x 24 x 10 inches as folded and you can put it in your closet or against a wall. It may be a little challenging to put it under your bed because of the 22” arm sticking out. The maximum user weight capacity is specified as 265 pounds and the total maximum load is 330 pounds thanks to the very sturdy frame. The transport wheels are located at the front and a bit small for moving the unit on carpets, but the treadmill is lightweight enough. These small wheels are designed for use on hard floors. You can walk or jog for long periods on this sturdy electric treadmill and you shouldn’t have any problems with stability. But it is reported to stop at 60 minutes if you’re not using one of the preset modes, then you can restart. You need to be near a power outlet to plug the treadmill in before starting to use it (no batteries). You can listen to music or watch TV while you’re exercising as this treadmill is not loud- makes only a little bit of noise. If the running belt is off to the left or the right- not centered, you start walking on it and pushing it towards the other direction to balance it. When it starts making noise you can put some lubricant on either side of the belt. Judging by the experiences of the customers, the customer service team is quite helpful and they try and solve the problems. It should work for those that need or want a basic, compact treadmill with manual incline, sturdy construction, versatility and user-friendly functions. It is offered at a fair price for what you’re getting and we don’t hesitate to recommend it.